Thursday, July 30, 2015. Chaos and violence continue, the US continues dropping bombs on Iraq, Turkey continues dropping bombs on Iraq, it's as though all of Iraq has turned into the Gap Band singing "You Dropped A Bomb On Me," and much more. “No one can make you do what you don’t want to do and no one can stop you from doing what you want to do,” my grandmother always said. My grandmother is the most acclaimed and respected actress in Iraq. In a career that spanned over 40 years, she shaped the female role in both theatre and television in Iraq. She was the first Mandaean actress in history. Mandaeanism is an ancient and a minority religion that resides in Iraq and Iran, to which we belong. My own mother is the first female president of the largest Mandaean association in Australia or anywhere in the world. It's easy to bury history. You can, for example, just hide it under the rubble. U.S. and coalition military forces have continued to attack Islamic State of Iraq and the Levant terrorists in Syria and Iraq, Combined Joint Task Force Operation Inherent Resolve officials reported today. Officials reported details of the latest strikes, which took place yesterday, noting that assessments of results are based on initial reports. -- Near Haditha, eight airstrikes struck an ISIL tactical unit, five ISIL staging areas and as ISIL command and control site and destroyed two ISIL vehicles, three ISIL structures, an ISIL berm, an ISIL IED belt, eight ISIL mortar systems and an ISIL fighting position. -- Near Kirkuk, one airstrike struck an ISIL heavy machine gun position. -- Near Makhmur, three airstrikes struck an ISIL tactical unit and destroyed three ISIL fighting positions and three ISIL buildings. -- Near Mosul, four airstrikes struck an ISIL tactical unit and destroyed five ISIL fighting positions, two ISIL bunkers, an ISIL weapon cache, an ISIL excavator and an ISIL light machine gun. -- Near Ramadi, three airstrikes struck an ISIL tactical unit and destroyed an ISIL tank, an ISIL vehicle and an ISIL mortar system. -- Near Sinjar, one airstrike struck an ISIL tactical unit and destroyed an ISIL light machine gun and two ISIL fighting positions. -- Near Tal Afar, two airstrikes struck an ISIL tactical unit and destroyed an ISIL vehicle and an ISIL fighting position. It was probably stupid for anyone to think that the same US government that went to war on Iraq in 2003 was going to extend a helping hand. The US government should be cleaning up the environmental damage done. The burn pits in Iraq, for example, injured many American troops and contractors. Those burn pits remain in Iraq polluting the environment whether or not they're used. Falluja is a chemical dumping ground due to the weapons -- confirmed and denied -- that the US government ordered used there. The birth defects result from this -- as though the US government's biggest export was some sort of play-at-home version of the Love Canal. Instead of cleaning up these toxic minefields, the US government now 'helps' Iraq by endlessly bombing it. Again, there are many ways to bury history -- among the easiest is to just let rubble fall over it. 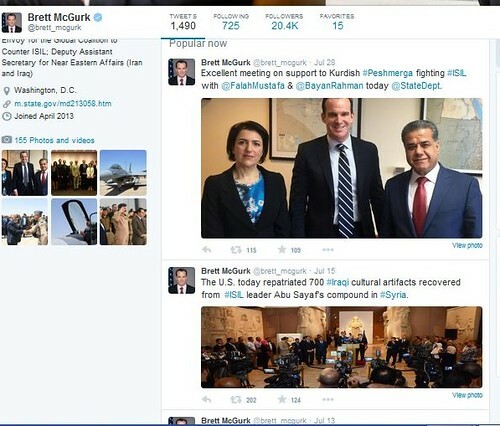 As the day began, the State Dept's Brett McGurk's Twitter feed looked like this. But for some reason, Brett began creating new Tweets but backdating them. He spent considerable time this morning posting Tweets, newly posted today, but with older dates on them. Again, it's very easy to bury history. Especially when all involved agree not to ask questions or even speak of what you've done. The same press that pretends there's nothing strange about a government employee using his work time to create a false (and public) narrative is the same press that never asks how bombing Iraq from war planes today helps? Is anyone in the press ever going to be brave enough to ask that question? Recruitment for the Islamic State is not dropping. Most estimates have it increasing but it is, at the very least, maintaining its recruitment numbers of the last six months. How does dropping bombs on Iraq address the recruiting numbers for the Islamic State? Maybe it's one reason there are so many doubts about the 'purity' of the US government's motives? 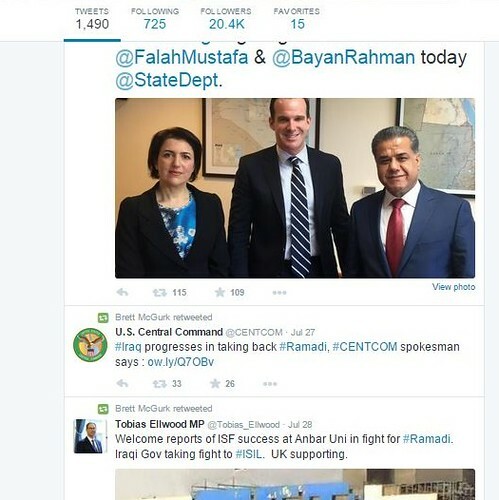 US doesn’t want to resolve the crisis and put an end to Islamic State. On the contrary, it’s eager to exploit the jihadists “to achieve its projects in Iraq,” Qais Khazali, a leader of Iraqi Shiite fighters has said. "We believe the United States of America does not want to resolve the crisis, but rather wants to manage the crisis,” Qais Khazali, a leader of Asaib Ahl al-Haq (AAH), an Iraqi Shiite paramilitary group, told Reuters in an interview. The US government has carried out a war on Iraq under the pretext of 'helping' Iraq. At what time does any sober, thinking person find the honesty to ask: How does dropping bombs on Iraq help the Iraqi people? It is long past time for #IraqiLivesMatter. There's little honesty in the press corps and that was demonstrated yet again today. Background: At the end of last week, Turkey began bombing northern Iraq. It did so with the approval of the US government which sought to argue that Turkey had a "right" to bomb Iraq. 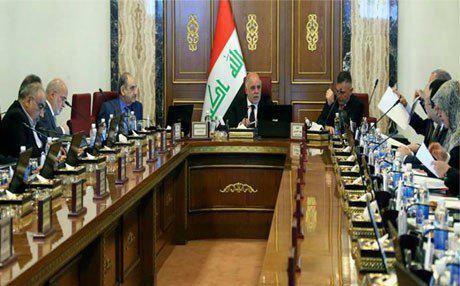 The government of Iraq, however, disagreed. In response, the US State Dept stopped their daily briefings -- no briefings Tuesday or Wednesday. Today, the press briefings resumed with spokesperson Mark Toner taking over from Monday's John Kirby. Not one reporter or 'reporter' bothered to ask the State Dept to explain how they could praise and defend Turkey's bombing of Iraq when the Iraqi government -- a supposed ally of the United States -- was calling the bombings a violation of their national sovereignty? It's not that they ignored the bombings. It's just that, yet again, no one gave a damn about the Iraqi people. QUESTION: -- you indicated earlier – you said the U.S. believes that Turkey’s attacks against the PKK are a form of self-defense. Overall, is there U.S. concern that if these types of attacks continue that it’s going to be destabilizing to the overall U.S.-led mission against the Islamic State? MR TONER: Well – and thank you. I can’t reinforce that enough, that the recent PKK attacks, and, of course, the Turkish military response, have nothing to do with our counter-ISIL efforts. And I know that there’s a tendency to lump them together. We’ve been – we can’t be more clear about that. That said, it’s PKK that’s initiated this violence; Turkey’s retaliated in self-defense. But we want to see, obviously, that situation calm down. We want to see the PKK cease violence and return to negotiations, and we would urge the Turkish Government, obviously, to respond proportionately. QUESTION: Is there a concern that they have not responded proportionally so far? MR TONER: Again, I don’t – these are longstanding issues. This was the PKK that carried out attacks against Turkish military. They have carried out a series of airstrikes in retaliation. I think what we want to see generally is the PKK to stop these attacks so that the situation can calm down. QUESTION: Yeah, but do you think that the Turkish airstrikes have been disproportionate? MR TONER: -- and that’s been very clearly our line. QUESTION: So thus far, at least, what the Turks have done in terms of the airstrikes against the PKK is okay and is in accordance with the U.S.-Turkey understanding on how to go about business, the business of countering ISIL? MR TONER: Well, again, I don’t want to – I want to separate the two out. Because what we agreed to in terms of our coordinating closely with Turkey on anti-ISIL efforts is a different thing altogether than these PKK attacks and the strikes carried out by Turkey. QUESTION: So you’re saying in conversations with the Turks about this the PKK has not come up once? MR TONER: Oh, I don’t necessarily think that. In fact, we – look, our position’s clear. We’re – they’re a foreign terrorist organization. We consult with the Turks a lot on PKK issues. But I think we want to see – just to be clear, we want to see the PKK stop these provocative attacks, and we want to see the Turkish Government respond proportionately. QUESTION: -- but is there anything having to do with attacks on the PKK that is contained within this understanding that you reached with Ankara? QUESTION: Okay. So as far as you’re concerned, the Turks can do whatever they want with the PKK in terms of airstrikes, as long as they don’t hit the YPG, the other Kurds? MR TONER: Right, but I think that we want to see – we want to see this settled down. QUESTION: I understand what you want to see, but you’re not going to complain if the Turks continue to attack the PKK. MR TONER: Well, I don’t know “complain,” but we’ve been very clear that these are separate and that Turkey does have a right to defend itself. QUESTION: -- in response to a question about whether or not this complicates things there. QUESTION: And I would submit to you that regardless of whether you think it complicates stuff standing in Washington right now, on the ground there it does complicate things. MR TONER: Yeah, but there’s – anyway, they’re located geographically in different areas. Again, I don’t want to get into the details about how you tell them apart, but it’s very clear that they are separate entities. QUESTION: So your alliances are based on geography? I’m sorry. QUESTION: You form your alliances based on geography? MR TONER: No, no. We just know that the PKK, where they hang out. That’s all I’m clarifying. They’re in northern Iraq mostly is where they base their operations. QUESTION: -- where the lines of the map have become completely blurred. MR TONER: I understand – I understood your question, but again, I would refer you to the experts who are following these kind of movements on the ground and can delineate. Yeah, please. Go ahead. Sorry. QUESTION: Just two questions. The U.S. ambassador in Iraq and General Austin met with President Barzani yesterday. And according to local media reports, they discussed the Turkey-PKK conflict. Do you have anything about the content of those meetings to share with us? MR TONER: I don’t, frankly. So I can try to get more of a readout. I don’t know what we – we consult, obviously, all the time with the Kurdish region. But I don’t have any specific readout of that meeting. You can bury reality under many things -- not just rubble, even a barrage of words. Bombs aren't falling on an empty regions. Rasul Abdullah Faqi, a father of seven from Inzi, a village at the foot of the Qandil mountains, said the population lived in fear of more air raids. “The strikes hit our village in several spots and we have lost a lot of cattle. Some of our farms were damaged or burned down,” the 40-year-old said. He pulled his donkey out of an enclosure to show a makeshift bandage he wrapped around his animal to cover a deep wound. “There are no PKK members in my village, they’re further up, quite far from here,” Faqi said. “The people are scared, some have left but many are staying and will stay until the bitter end,” he said. Margaret Griffis (Antiwar.com) counts 194 violent deaths across Iraq today.